Upgrade your backpack to this Pokemon Poké Ball Backpack! This large backpack features a main zippered pocket, a mid-section pocket, multiple front pockets. Adjust the straps to fit perfectly and when you are done, hang your backpack on the attached handle. 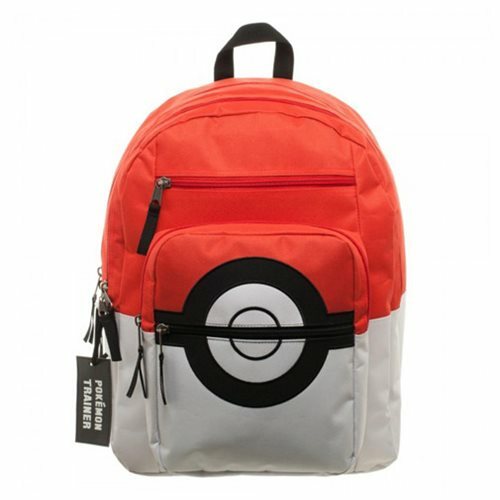 Filled with ample space, store your essentials like poké balls, your pokedex, and much more! Prepare for your travels with this Pokemon Poké Ball Backpack! Measures approximately 13-inches wide x 19-inches tall x 8-inches deep. Ages 13 and up.